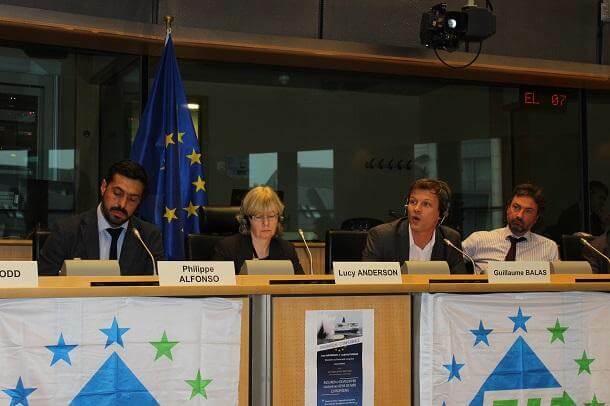 On Wednesday 21 October 2015, the ETF and S&D Group co-hosted the seminar called “Ensuring a future for European seafarers”, which addressed the continuous deterioration of European-based seafaring jobs. The sponsoring MEPs I. Thomas and L. Anderson recommended that, in the face of unbridled social dumping which turned European seafarers into an endangered species, time has come to establish a maritime space in which EU social legislation applies and where quality shipping is the rule in order to guarantee EU-based jobs and know-how. Social dumping is unfortunately a phenomenon that has spread across all transport modes. “However, while we see for example in road transport that the cause for the erosion of social and labour standards is mainly the lack of enforcement and control of existing EU legislation, the root for the problems in shipping lies actually within the absence of strong EU social legislation” stressed TRAN Committee coordinator I. Ertug. The conference has clearly indicated that the European Commission together with the European Parliament and the Council has to set sail to protect those that keep the shipping economy running every single day, namely our seafarers” he added. “Cut-throat competition is threatening our seafarers and know-how, it pulls our social and wage conditions down” deplored MEP I. Thomas who insisted that this Conference should act as a wake-up call for all stakeholders concerned, primarily the EU co-legislators. At the seminar, along with MEPs, a number of key players – amongst them EU/national union representatives, national MP, academics, experts on maritime safety but also able seamen who are experiencing at first hand the devastating effects of deregulation – unveiled the inconvenient truth about work patterns in shipping which is taking place even in intra-community waters. Aware of the fact that this gloomy picture that was painted was only the sad reality, the S&D Group committed to call for urgent actions based on the proposals made by the ETF in its Manifesto on Quality Shipping. The Chair of the Inquiry Commission on the Erika disaster, Georges Tourret, very much regretted that the EU has been incapable to create a genuine EU maritime space as intra-EU cabotage is seen as international shipping. “While the EU managed to create a Common Fisheries Policy where fishing rights are linked to the flag State, in European shipping instead first registers have never been so weak compared to Flags of Convenience and second registers that have consolidated and imposed the low cost crewing model” he said. To introduce a Jones Act suited to Europe. In this regard, MEP Guillaume Balas who is drafting an own-initiative report on social dumping in Europe, due for February 2016, urged the EU negotiators not to dismantle this federal law. “Instead, the EU should get some inspiration from a law that protects national cabotage and state that cabotage can only be done by ships under American flag, built in the US, belonging to a US ship-owner and with American or American permanent resident workers on-board” the MEP said. To reintroduce the “Manning” directive proposal of 2004 with suitable adaptations, to regulate cabotage between Member States. To call on the Commission for reliable and comparable data on the current state of play. Finally, all participants pointed out on the need to safeguard the critical mass of European seafaring jobs to avoid losing the maritime know-how and the EU maritime cluster that demand seafaring expertise. “If the EU is serious about creating jobs in the maritime industry, it should make use of the window of opportunity offered by the mid-term review of the EU maritime transport strategy until 2020” said Philippe Alfonso, ETF Political Secretary for Maritime Transport. “Jobs, growth and fairness, those are the key words used by Mr. Jean-Claude Juncker when committing himself to an ambitious agenda for a new start for Europe. Shipping is cruelly short of fairness, and something needs to be done to address this shortcoming!” he concluded. You can download the ETF Manifesto for Quality Shipping below.